Strong form, dynamic space, texture, and an emphasis on both natural and artificial light identify this elegant award-winning station designed by architect Ellerbe Becket, Inc. in collaboration with artist Robert Millar. By questioning the very nature of place versus space, the artist and architect seek to heighten our awareness of our location within the urban environment. The main entrance is marked by a bold architect-designed stainless steel “wing” canopy, and the artist-designed space beneath is punctuated by subtle skylights which flood the 42-foot high space with daylight. At night, on the street level, these skylights become a brightly lit “stage” made available to performing arts groups. 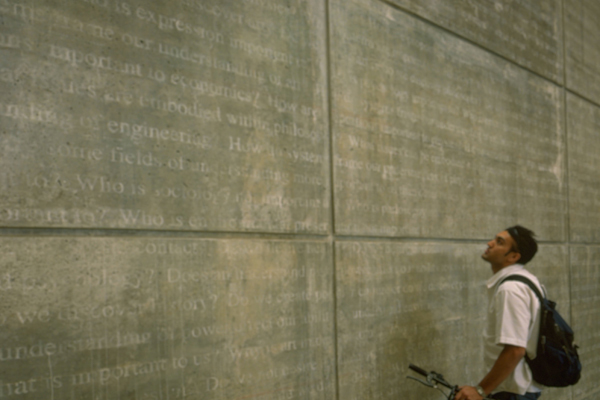 Reflecting his inquiry into issues related to the project, artist Robert Millar layered thousands of subtly painted questions onto the concrete surfaces of the main entryway. As escalators carry riders through this space, overhead beams rhythmically reveal polycarbonate and aluminum paintings while natural and colored fluorescent lights reflect on their undulating surfaces. The team worked with the nearby Braille Institute and LA City College to incorporate a variety of interesting textures into the station’s design as well as to provide the plaza level performance area. This team-designed station won a coveted Architectural Design Citation from Progressive Architecture magazine. Collaboration with Ellerbe Becket Inc., Architects. ELLERBE BECKET is one of the oldest and largest architecture, engineering and construction firms in the United States. They have worked in all 50 states and more than 20 countries. The firm has designed such Southern California icons as the Capitol Records building and Los Angeles International Airport. Mehrdad Yazdani served as lead designer on the project for Ellerbe Becket. As a lead designer with Dworsky Associates, he also designed the Soto Metro Rail Station.